PITTSBURGH (AP) — Philip Rivers didn’t exactly spend a lot of time poring over the most accurate performance by a quarterback in NFL history. 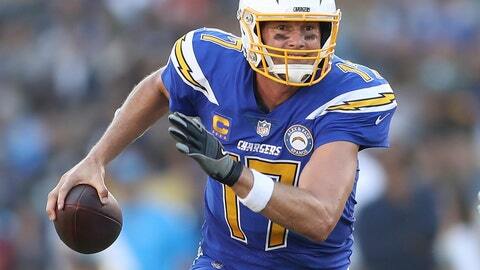 The longtime Chargers quarterback understands there’s no time. “We’ve got a heck of a December ahead of us,” Rivers said. So Rivers gave his 28 for 29 day in an almost comically easy 45-10 over Arizona last Sunday a cursory look, lingering over his one mistake — a second-quarter fumble on a play he audibled to — far longer than any of his three touchdown passes or his record-tying 25 straight completions. The 15-year veteran is well aware miscues of any variety need to be avoided when Ben Roethlisberger is on the other sideline just waiting to pounce in a place that’s not exactly hospitable to teams in visiting white jerseys, particularly as the calendar hits December. The loss cost the Steelers the inside track at the No. 2 seed in the AFC playoffs and set up the possibility that Los Angeles’ visit to Heinz Field could be the first of two such meetings. Not that Pittsburgh is getting caught up in “what ifs,” not with a December schedule that includes games against the Chargers, New England and New Orleans. Roethlisberger and Rivers are seventh and eighth on the all-time list for career yards passing, throwing for a combined 108,196 yards — or 61.5 miles — since they came into the league in 2004. The two understand they are inextricably linked, though there’s one thing — two actually — that Roethlisberger has that Rivers does not: a Super Bowl ring. A victory on Sunday wouldn’t guarantee a shot at one, but it would stamp the Chargers as a team built to compete in January and perhaps beyond. Rivers isn’t consumed by the big picture, however. Focusing on the small one is tough enough. “I’m trying to get a first down on Sunday night to be honest with you,” he said. The Chargers receivers, who will need to pick up the slack with running Melvin Gordon’s injury. Gordon is week to week with a sprained MCL in his right knee. Mike Williams had two touchdown catches last week while Keenan Allan has a TD in three straight games. Williams was a deep threat early in the season, but showed off his athleticism in last week’s win over Arizona with two catches near the boundary line at the back of the end zone. Los Angeles defensive end Joey Bosa missed the first nine games because of a bone bruise to his left foot, but made his presence felt in his second game back last week with two sacks. Roethlisberger has always been a difficult quarterback to take down, but Bosa’s speed could give him an advantage.